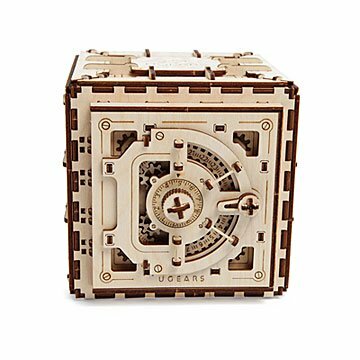 Before you crack this safe, you have to build it from 179 laser-cut Baltic birch parts. We Googled "parts of a safe" to research this design, and the FBI paid us a visit. Once we talked our way out of that, we found that this amazingly engineered kit forms a fully functional, three-digit combination safe. Basically, before you crack it, you have to build it: assemble 179 laser-cut, numbered Baltic birch parts to form a desktop safe to hold small essentials or diminutive dossiers. The customizable combination will keep aspiring safecrackers guessing. No hatchets or hand saw shortcuts, please. The all-wood kit requires no glue or hardware. Made in Ukraine. My son is a mechanical engineer, and I sent this to him for his birthday. His girlfriend said he worked on it non-stop. He texted picture updates to me as he was working on it. After he was done, we face-timed so he could show us how it worked. I haven't seen him so excited about something he built, since he was a kid working on Lego projects! Proud Mom! My boyfriend Loved getting this for Valentine's Day. He loves working with his hands and last year I bought him a puzzle he solved in half an hour, so I knew I had to up my game. It took him an entire weekend to build this and I could tell her really enjoyed it! It's a bank not a safe. It was great fun building the kit, although it takes some time. The instructions were clear as long as you pay attention to some of the highlighted details. The wood is a little fragile and I did have one (non-critical) piece break but as long as care is taken while assembling it shouldn't come apart. I used a rubber mallet to ease parts together. Pieces came apart with some coercion. I broke no pieces in assembly, even with the mallet. Some hand strength is needed, and instructions might be too much for a 14yo. It took me 4 hours to casually build (an adult builder, with experience). This was a Christmas gift for my best friend. He described it as feeling like a old school Christmas where you got the gift and then the family gathered around to help build the safe. There is lot of intricate pieces but he said it was a blast to assemble. Some of the pieces were a little snug going together but since it's made out of wood a small hammer did the job nicely to help assemble. Bought this for my brother and he absolutely loved putting it together! Took him a few hours to do the whole thing and he was entertained the whole time. The safe is very sturdy and well made. Fantastic gift for older teens! My son LOVES this, and has very much enjoyed the assembly process. So far, no cons we can see! Incredibly interesting model that really lets you see how a lock mechanism can work. The build can be difficult and the pieces are hard to get together at times. A few pieces broke when the person I gave this to attempted to assemble it. That being said, it is a beautiful, intricately designed safe and makes a nice gift for someone who has a good deal of patience and gentle hands.